Does Tapping really work for chronic pain and emotional distress? You bet it does! Read all about how the powerful EFT tapping technique supported Jane McDermott back to her own good health in this months Good Health Magazine. The reputable publication approached me regarding an article they planned to run on alternative pain management. Upon being asked if they could interview one of my clients who had come to me with ’emotional stress and physical pain issues’, I knew immediately who I would like to choose; Jane McDermott from Be Nutrition. I am eager to share this with you, as I know many of you will benefit when you hear how another human being who, with my support, has committed to healing herself. It’s important to recognise that Jane integrated other healing methods such as changing her diet, in addition to using the powerful tool EFT and Matrix reimprinting. I wake up each day feeling so happy doing what I love, supporting people like Jane to release emotional pains. Understanding fully that when you do, your body has a greater opportunity to heal. Jane and I worked together intensely over a period of 6 weeks to release stress held in the physical body and old emotional trauma’s. When I see Jane now, and how far she has come, thriving in so many ways, I am even more committed to helping others to heal their own physical and emotional pain. Sharing the positive break-throughs really helps you to know it’s also possible for you too. 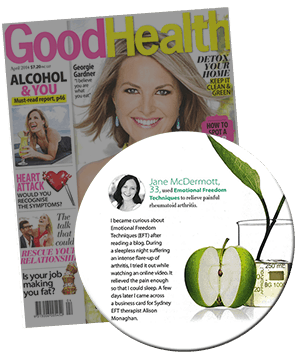 Read all about how using the powerful EFT tapping technique, I supported Jane McDermott back to her own good health featured in this month’s Good Health Magazine. This article featured in the Good Health Magazine is yet another endorsement that this mode of therapy is on the rise and will continue to support many thousands of people worldwide suffering anything, from major trauma to giving up sugar or cigarettes. Since I began using EFT within my coaching practice in 2007 I consistently witness the results in my clients and it is because of its increasing high rate of success, the use of EFT is rapidly spreading, including Doctors and psychologist who can now be found using EFT in countries all over the world. Why not join me and special guest Jane McDermott at my next SoulTreat in June, find out more here. Great article. So glad to see more about this positive technique in the media. I’m looking forward to attending your EFT workshops in May to learn more. Thank you Karen and looking forward to seeing you in May for more Tapping! Great article by your client and perfect comment by you!